Earlier this week, after a grueling month of competition, Austin’s Bill Norris emerged as the best of twenty contenders in the nationwide Shaker Faces competition, a collaboration between Combier Liqueur d’Orange and Lush Life Productions. 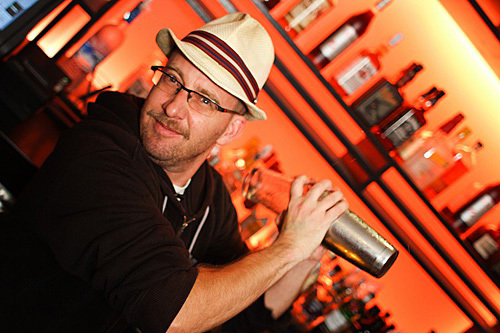 The virtual shake-off pitted bartenders from around the US in head-to-head video duels. Prior to the competition, Lush Life roamed the country to catch bartenders at their best: behind the bar and shaking cocktails. Whether they’re hard shakers or more musically inclined, bartenders all make a face when they shake, and the Lush Life crew captured a variety of Shaker Faces during their travels. Fans were encouraged to vote for their favorites each day at the official website, shakerfaces.com. LA’s own Joseph Brooke (The Edison) seemingly had the Shaker Face crown locked by ruling the competition for five straight days with his innovative (among other things) Quad-Shake. Then on the final day of the competition, Norris (Bar Manager at FINO and the upcoming Haddington’s) took the top spot with 70% of the votes and a sixth win, representing over 1500 votes and nearly 4000 video views. Norris was awarded $500 and will take his title to this year’s Tales of the Cocktail, where filming will begin again anew to decide the next Shaker Face King or Queen, and a chance to win a trip to France in the Fall of 2010. The one thing missing from the competition was a final showdown between Norris and Brooke, so with that in mind, their Shaker Face videos are embedded for you to make your own decision. Cheers to all the bartenders, looking forward to the next round of Shaker Faces! Bill Norris from FINO in Austin, TX from Shaker Faces on Vimeo.